We can only possibly repeat what was written in the Beer Chips description: With a Margarita glass in the background, writing on the left hand side in big bold letters and a garish green shiny bag, these are not only perfect for bar use, but modern bright and colorful. Chips packaging should be modern or original and this is certainly original. Although thicker than regular Chips they were thinner than many Kettle Cooked Chips. Perhaps ironically, this meant there was more crunch than usually found with Kettle Cooked Chips. Kettle Cooked, so thicker than regular chips and with probably a bit too much oil. The Chips were different shapes and sizes with a lot of curled examples. Some were folded flat or stuck together. A bit on the greasy side. It's hard to say whether Beer Chips, or their parent company Barrel O' Fun, know what flavor these are. On the previous packaging it declared that they were Margarita with salt, which many would agree doesn't sound too tasty. They are now apparently Salt & Lime flavored Margarita, which sounds a bit better. As far as we can ascertain it is the same recipe. 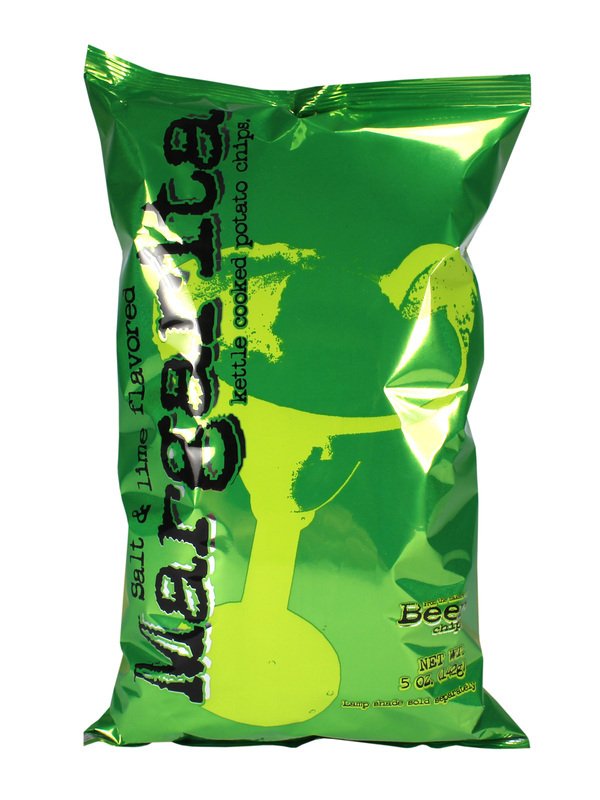 There is a lime flavor and a salt combination, and if there is any Margarita flavor it is mild.